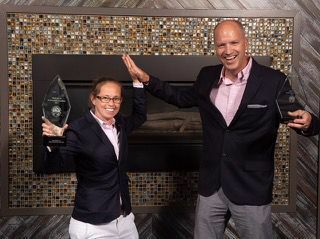 On Friday, May 18th, 2018 the Home Builders Association of Delaware (HBADE) held their 26th Annual Regal Award ceremony at Bethany Beach Ocean Suites in Bethany Beach, DE. The award ceremony included builders and home remodelers throughout all three counties in Delaware. There were 66 categories that were rated by 6 judges. 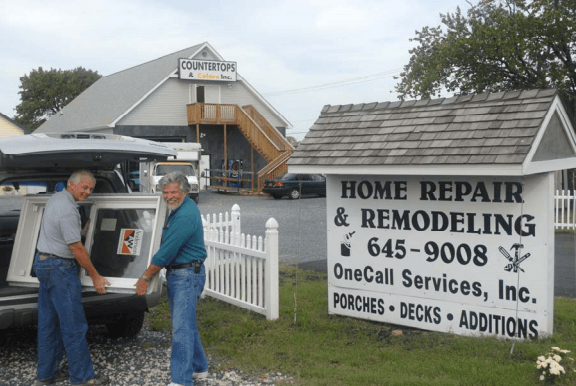 One Call Services first took home the award for Sussex County Remodelor of the year. Later in the evening they took home the statewide Delaware Remodelor of the Year award. 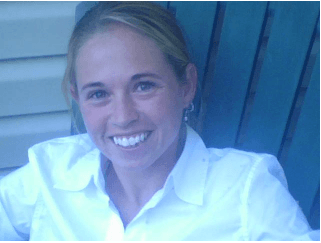 Multiple projects managed by Vice President Khara Landon sealed the deal for One Call Services victory. “The awards came as a really pleasant surprise,” said James Stevenson, owner/president of One Call Services. “I am extremely proud of the work that Khara and our team produced. We really hit it out of the park!” Khara Landon submitted her in-town Rehoboth project which was featured as the remodeling showpiece for the night. She said “It was such a pleasure to work with Billy and Debbie Zimmer. Their style is so much fun to bring to life. Mr. and Mrs. Zimmer have impeccable taste. This particular project came with a lot of obstacles, and our great team of craftsman were able to make those visions a reality”. One Call Services will be going into their 20th year in business next year. James and Khara have been working side by side since 2009. In addition, James and Khara are both Certified Graduated Remodelers in Delaware, a designation that requires a tested level of knowledge and adherence to a strict code of ethics. 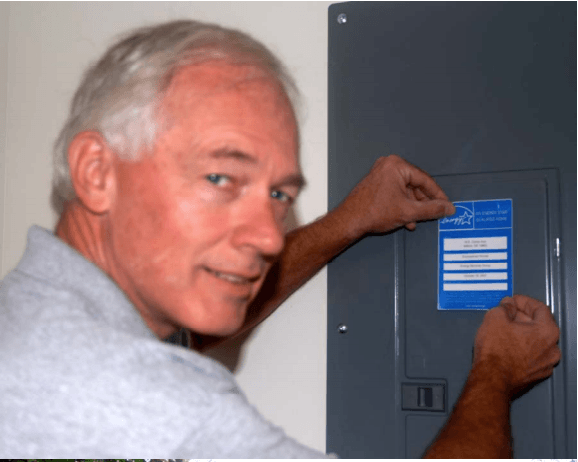 James is also a Certified Aging in Place Specialist, where his expertise can modify your existing home which allows you to live more comfortable as you age. You can find out more about One Call Services by logging onto their website www.onecallservices.biz and “like” their Facebook page. You can also follow them on www.Houzz.com to see all of their up to date projects. We live by our motto “We Show Up!” Now, who is ready for us to remodel their space? The playground at Shields Elementary School in Lewes was built in 1995 by about 500 volunteers. The project took thousands of worker hours over a six-day period at a cost of $40,000, which was raised by donations. In August 2011, 40 Schell Brothers employees provided needed repairs, sanding and covering the wooden playground with 40 gallons of solid stain wood covering. During the current school year, the playground was once again found in need of some repairs. This time the need was replacing rotting posts, securing sliding boards, replacing boards and railings, and doing many other safety repairs. 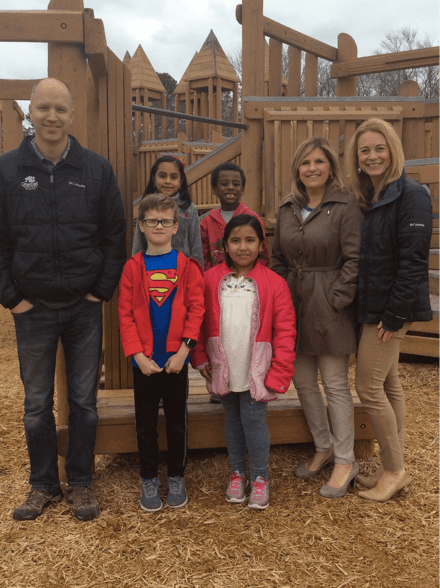 One Call Services stepped up to the challenge and donated its time to do all the needed upgrades, in hopes that the playground will withstand the test of time until Shields moves into its new location at the Lewes School in four or five years. On the Only In Your State website, the Shields playground is listed as one of the 11 amazing playgrounds to visit in Delaware. To see the full list, go to www.onlyinyourstate.com/delaware/playgrounds-in-de. 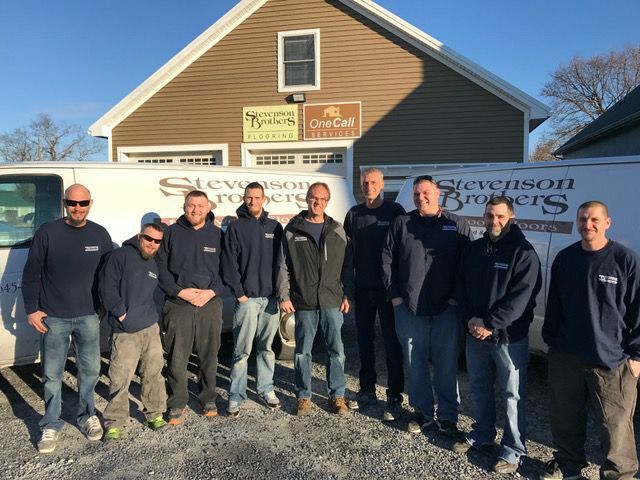 Stevenson Brothers Flooring celebrates its 20th anniversary serving eastern Sussex County in April. "This community has been very good to us over the last 20 years," said Mike Stevenson. "We've worked with many of the great builders in the area, as well as thousands of homeowners. We want to thank every one of them for using our service over and over again." Stevenson Brothers specializes in supplying, installing and finishing hardwood floors. They also refinish existing hardwood floors that need sprucing up. "There is no flooring like hardwood flooring," said Josh Stevenson. "It is so versatile and offers the best look. There are so many beautiful species of wood and varying color variations we've worked with over the years. We feel like we can give anyone anything they can dream up." Many members of the team have been there for much of the company's history. Bo Sykes has been with the company since 1998, Billie Roberts since 2001 and Lewie Bryan since 2005. "It says something special about a company, I think, when you have people working with you for that long," said Mike. "It allows them to master their craft, and it gives our customers a consistency that they really appreciate." Stevenson Brothers Flooring is looking forward to the next 20 years. "Sussex County is really a one-of-a-kind corner of the world, in my opinion," said James Stevenson. "I see this incredible community of small businesses working together to build a wonderful place to live. We are humbled to say we've been involved in it for 20 years!" Stevenson Brothers Flooring is on Route 9 behind Bests Ace Hardware in Lewes at Five Points. For more information, all 302-645-1455. Vinyl siding is an ideal candidate for recycling. Old vinyl siding can be cleaned, chipped and re-melted into useful products such as decking, railings, and fences. The companies who do this are out of state so Delaware companies rarely recycle. 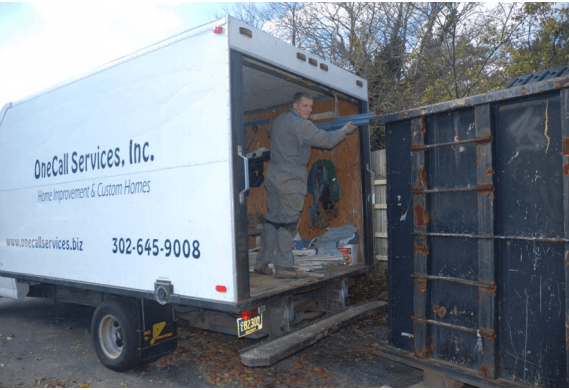 Conservation minded remodeling company, OneCall Services, Inc. of Lewes has begun recycling old siding “The problem is the logistics of getting the siding to the recyclers in a cost effective manner”, claims James Stevenson, Vice President of OneCall Services, Inc. An agreement was reached with Regency Polymer Services, Belcamp, MD, to recycle almost fifteen thousand pounds of vinyl siding from a large re-siding job in Rehoboth Beach. Regency will supply a dumpster at the construction site, cover the transportation cost, and pay a few cents/pound for the product. OneCall will strip the siding and load it into the dumpster. “Most importantly, we are not sending this to our landfill and we save several more cents/pound in hauling and dumping fees”, says Stevenson. Stevenson added, “ We were already recycling one hundred thousands pounds of concrete and cinder block from this project along with aluminum and cardboard and will wind up reducing total waste by about 80 %”. 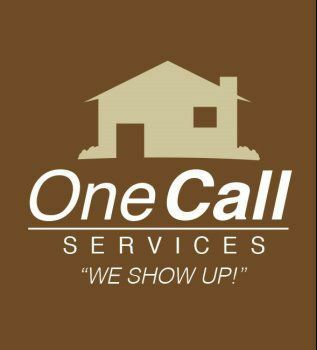 OneCall Services, Inc. does a wide range of remodeling, home repair, and custom home services. They have built Energy Star and “Green” building projects and can be reached at 302- 645-9008 or on the web at www.onecallservices.biz. DAVID STEVENSON 302-645-9008 OneCall Services, Inc.
OneCall Services Ranks #223 Among Nations Top 550 Full-Service Remodelers Lewes, DE, 1/20/09 – In a study done by Remodeling Magazine, OneCall Services, Inc was ranked at number 223 of the nation’s top full-service remodelers, placing them in the top 1%. According to the Joint Center for Housing Studies of Harvard University, there are approximately 530,200 contractors providing remodeling services in the U.S. The “Remodeling 550” list is based on the 2008 revenue of the largest remodeling and home improvement companies in the country. The data used to create the list was compiled by the publications Remodeling Magazine and Replacement Contractor, along with Specpan, a business data provider. 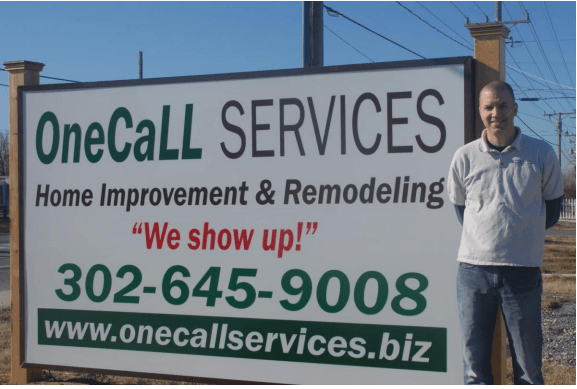 OneCall Service’s ability to grow can be attributed to a strong reputation in eastern Sussex County as a reliable source for home repair and remodeling needs. James Stevenson of OneCall Services sees this as validation for their hard work. “Ourcustomer’s trust in us is why we are successful.” Stevenson said. “We pride ourselves on being professional, detail-oriented and friendly. Our customers reward us by consistently coming back to us for more business, and referring their friends and family to us.” Working with single-family home owners, home owners associations, realtors and property managers, OneCall Services, Inc does whole house remodeling, additions, porches, decks, kitchens, baths and small home repairs. The company also designs and builds custom, energy efficient “green” homes. For more information contact OneCall Services toll free at 877-645-9008 or on the web at www.onecallservices.biz. CONTACT: DAVID STEVENSON 302-645-9008, ONECALL SERVICES, INC.
OneCall Services, Inc. of Lewes received the 2007 Rehoboth Cottage and Town Award for residential renovation sponsored by the Rehoboth Beach Main Street Program. The winning project was a renovation that added nearly 50-percent more space to the home located at 118 Hickman St., while maintaining a cottage appearance. Main Street Rehoboth designed the award to recognize and encourage contributions of property owners to the charm, beauty and ambiance of the community through recent restoration/renovations, new construction or preservation initiatives. Those sentiments are very close to the heart of David Stevenson, president of OneCall Services, Inc. OneCall Services specializes in renovations, remodeling, green building and creating energy efficient spaces for their clients. “We only accept projects that fit into the existing neighborhood,” said Stevenson, Because of small lots and the town’s strict limits on setbacks, minimum green space requirements and the strong desire to maintain the classic small town cottage look of Rehoboth, enlarging and remodeling an entire home there has special challenges. Blending with the neighborhood while providing the extra space and modern amenities desired is a specialty of OneCall Services. 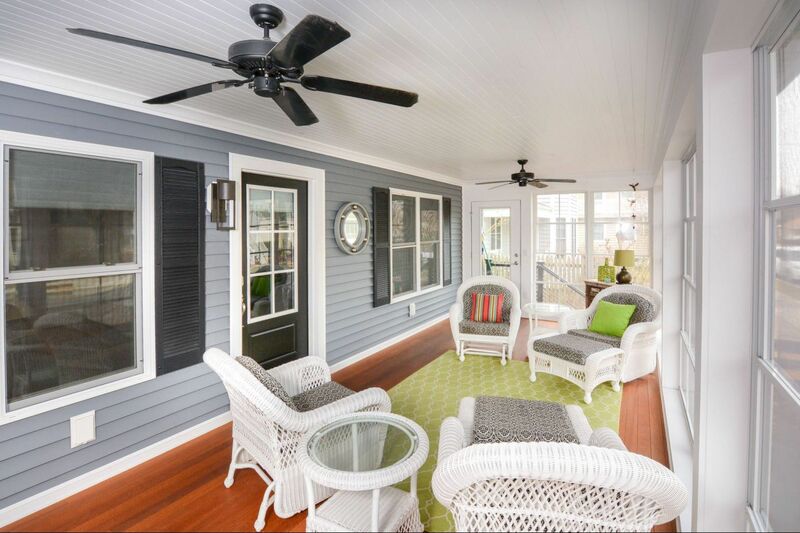 Usually the only way to add living space in Rehoboth is to go up by adding stories. In this case homeowners Joe and Susan Wagman wanted to enlarge and modernize the house while saving the existing first floor wood walls and floors. “They were great to work with,” said Stevenson, of the couple’s dedication to maintaining the homes historic integrity. The resulting transformation enlarged the house from 2400 square feet to 3500. The project included adding a second floor and renovating both the first floor and basement levels. “We do several projects like this every year and have gotten very good at it,” said Stevenson. 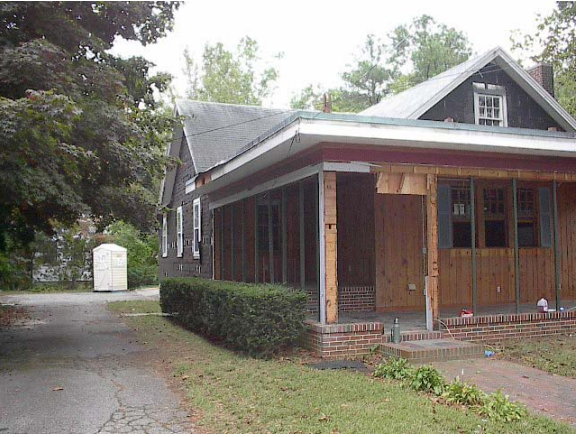 “You don’t want the original first floor damaged by the demolition process or by rain when the roof is open.” OneCall carefully coordinates preparatory work such as adding reinforcement, moving utilities, and doing interior demolition so the roof can be removed and the second floor can be framed and “dried in” all in one week. 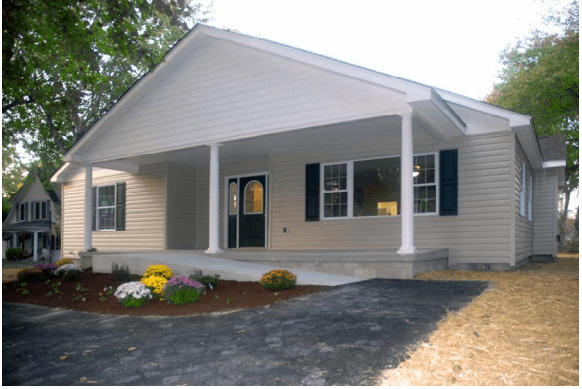 Besides space, the project added new electric, plumbing, HVAC, insulation, bathrooms, kitchen, windows, siding, roof and paint all consistent with the pre-existing home. OneCall Services, Inc., can design and build a full range of remodeling and custom home projects throughout Delaware and can be reached toll free at 877-645-9008 or on the web at www.onecallservices.biz. They specialize in environmentally friendly and energy efficient “green” buildings designed for ageing in place. In addition, David Stevenson is the first Certified Graduate Remodelor in Delaware, a designation that requires a tested level of knowledge and adherence to a strict code of ethics. For more information about the Rehoboth Main Street Program and the Cottage and Town award, please call the program coordinators at 227-2772. Al Dorman and Dave Stevenson share more than a driveway. They share a belief in helping your neighbors. Dorman’s New Kitchen/Counter Tops& Colors counter top production facility and Stevenson’s OneCall Services, Inc. remodeling office share a driveway on Route 9 near Five Points. It was only natural they would help out when they heard about Tony and Sissy Ciferni’s fire that destroyed their Kitts Hummock home. As if the fire wasn’t enough, they discovered their home owners insurance deposit was never used to obtain a policy. They would have to re-build at their expense. New Kitchens supplied cabinets and OneCall supplied doors, windows, lumber, siding, and money. “A lot of people have donated time and materials to help re-build their house” said Stevenson, “but they still need cash for part of the project and for temporary living expenses.” Donations are being accepted at the “Ciferni Fund”, 2433 Kitts Hummock Rd., Dover, DE 19901 The companies regularly recycle cabinets, appliances and building materials in their Belltown neighborhood and through Habitat for Humanity. Stevenson donated $1000 earlier this year for bicycle lights for foreign students who come to work at the beach each summer to help prevent highway accidents.